The government was concerned about the decline in wheat production and also the need to take measures to encourage pig farming, “as the consumer is increasingly dependent on imported bacon which is not agreeable to his taste”. The Committee’s Annual Report for 1919 noted that they had appointed a Bee Re-Stocking Sub Committee: “They have introduced into the County a stock of Italian-Dutch bees which possess fair immunity to Isle of Wight disease”. A skill shortage reported was that of thatchers. Hay and corn was spoilt through unthatched stacks and a scheme of training was set up for Land Army girls. Another pressing need was to find useful work for ex-servicemen. Apart from deployment on established farms, the government was keen that each county set up an Agricultural Institute where farmers’ sons and others should receive an education on the technical side of agriculture. 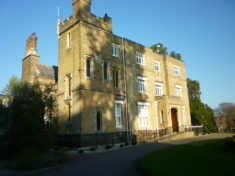 The County Land Agent recommended Oaklands Park, between Hatfield and St Albans, a property with 314 acres, a large country house, with space which could be converted into lecture rooms, laboratories, dining rooms and bedrooms for the students. There was also an agent’s house, which would make a suitable residence for the Principal, outbuildings, glass-houses etc. There then followed exchanges between the Agricultural Committee and the Government on the purchase price, compensation for the tenant farmers and the salary for the Principal. The first argument was on the purchase price. 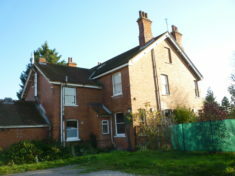 The Ministry thought the price high but eventually conceded that as attempts to induce the owner to reduce the price had failed and that there was no other suitable property in the county that could be obtained for a lower figure it gave general approval to its purchase at the price of £33,000. Another problem was the compensation due to the tenant farmers. After some haggling W H and C Moores accepted £2,500 to leave by Michaelmas 1920, subject to their being allowed use of the barn for threshing and being allowed to lift their potatoes when ready in October. Full details of these negotiations are in the Oaklands Institute Sub-Committee Minute Books (HALS/ HCC 32C). The college opened to its first students a year later with some changes to the Ministry’s prescriptions. Although it had ordered that the farm be run as a “demonstration farm”, trials were established. Secondly, the Ministry saw such colleges as providing a theoretical education. However, the Hertfordshire view was that a farmer could not be considered qualified if he was unable to demonstrate how a piece of work should be done. Another divergence was the make-up of the students. The Ministry envisaged that the Institute would provide an education for the sons of farmers. In fact, this was one of the objections to using the research station at Rothampstead as there were no suitable building to act as a students’ hostel around Harpenden which would mean Army huts or similar buildings. “It was thought that this would not be attractive to the type of student who might be expected to attend the Institute”. [iii] The reality was that Oaklands was never exclusive and its students came from very different backgrounds. [iv] Furthermore, from the beginning, Oaklands accepted women. Whilst the Ministry argued for a winter course for men and a summer one for women (thus allowing for one set of dormitories), Oaklands was for men and women from the start. By re-configuring doorways and corridors, accommodation for male and female students was arranged in separate wings of the house, each with its own entrance and staircase. By the second world war, women were in the majority as it became a centre for training of the Land Army. See “Long Days and Hard Work”. Link here. Oaklands College will celebrate its centenary in 2021. It continues to offer courses on agriculture and also a wide range of subjects from Art, Fashion and Design to Welding. Open days/evenings are regularly held at the St Albans and Welwyn Garden City campuses. 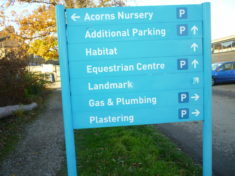 (See www.oaklands.ac.uk for more information). [ii] By March 1921the Committee were concerned about Mr Bolland’s ability to apply his scientific knowledge to farming. He took on the role of Assistant Director of the Kermani Institute in Africa. He was succeeded by Mr John Hunter-Smith. 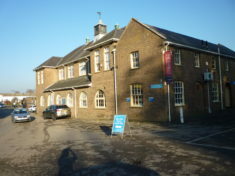 [iii] In practice, Oaklands maintained a close relationship with Rothampstead staff giving lectures and providing expertise as Dr Russell, Rothampstead’s Director noted: “Oaklands could be reached in about 20 minutes by motor car“. It was also within a few minutes walk from Hill End and Smallford stations. [iv] More information on the setting up of the college can be found in the Oaklands Institute minute books (HALS/HCC/32C) and in “The Oaklands Story: 1921 – 1971” by E C Pelham, available through the Hertfordshire Library Service – call number 630.71542585. This page was added on 16/01/2019.